Lightly wipe the base of the saucepan with butter and remove the green stalk (calyx) from each of the strawberries. Ensure that all of the fruit is completely dry (do not wash beforehand if possible), damping down with kitchen tissue paper where necessary. Add your strawberries to the saucepan, sprinkling each layer with white sugar. If you want your strawberries to remain in whole pieces, they should be covered and left overnight, so that the juices are released and the fruit firms up, becoming harder and therefore less likely to disintegrate when cooked. When you are ready to make your strawberry jam, place the pan on the cooker hob and turn the heat to a low temperature. At this stage, resist the temptation to constantly stir the mixture, since this will break up the fruit. Instead, shake the pan intermittently until you are confident that all of the sugar has vanished, being completely dissolved. Add the juice of the two lemons and increase the heat so that the mixture starts to bubble. At this stage, set your kitchen timer for six minutes and after this time has passed, remove the pan from the hob, away from the heat. Test the strawberry jam mixture on a chilled plate to see if it has reached setting point. If not, return the pan to the heat and test again at two-minute intervals until an adequate setting consistency has been achieved. Leave the mixture to cool down for 15 minutes or thereabouts. Mix in the butter so that any remaining scum will naturally disperse itself into the mixture, before pouring your freshly made strawberry jam into sterilised jars, filling to the very top. 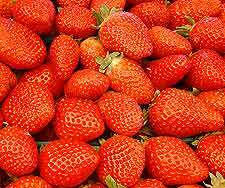 Strawberry Jam Recipe - More Jam Recipes.